Hire the best wedding music bands from Peter and The Master Keys in New York City for wedding reception, events and parties etc. Get the top jazz wedding musicians in NYC and book wedding reception music here!! There are so many wedding music bands in NYC that it can be hard to know where to start. First, if you haven’t already, narrow down the kind of music that you’d like to hear. Pop, country, rock, jazz…? These days it’s easy to find bands with a simple Google search. If you’re reading this then that probably means you’re looking for a jazz band for your wedding. 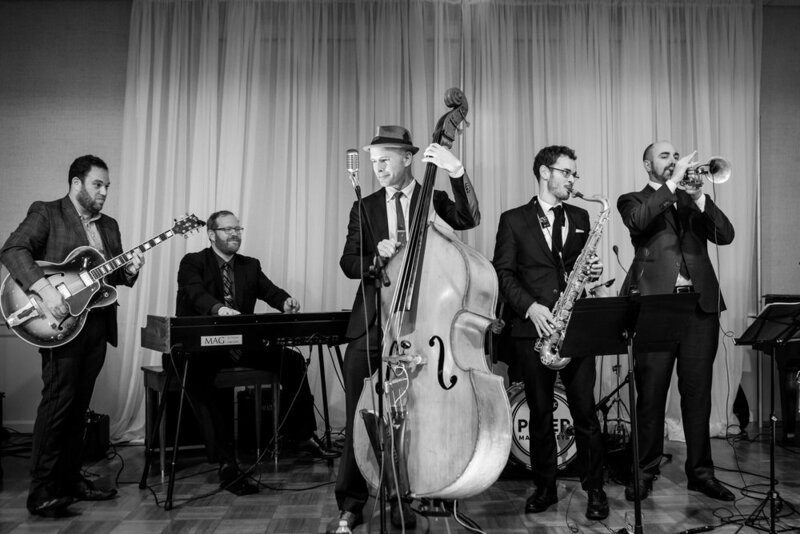 A jazz band is great for wedding reception music because it is classy, sophisticated and can lend a retro vibe to your wedding. What’s more, older relatives will really appreciate it and won’t be left out in the cold as can happen when bands play a lot of contemporary music. The Master Keys is great because it is an excellent jazz band that also does vintage blues and rock n roll. It’s a great and engaging mix for folks of all ages. There is a lot to choose from if you want great jazz wedding music in New York City. When you search on the internet you will find a few websites such as Gigmasters where you can view different bands and then ask for them to bid on your event. If you look a bit deeper you will find many stand alone bands, maybe even this one! You’ll likely check out their videos and reviews. Many wedding musicians in NYC have great videos these days. It has become increasingly cheaper to produce good content. So if you see videos that seem out of date or of poor production quality, that can be a red flag that they aren’t staying current or even working that much. Apart from that, look to see that they present themselves well and that they are playing with the energy and enthusiasm you are looking for. If you’re looking to hire the best wedding music bands, it is important to remember that some things can be hard to tell from the video. Most importantly, quality level and experience. Since the barrier for entry with video is so low now, there are many bands that can make a good looking video. But with good editing, it can be easy to obscure the musicians’ ability. There is a big difference between a musician fresh out of college and a seasoned professional. All the musicians in the Master Keys have conservatory training plus many years of New York experience between them. Experience also means knowing the ins and outs of weddings. There are so many aspects of the event that happen off the bandstand: working with the planner and client, efficiency and timeliness, working with catering and other vendors as a team, serving as MC, staying alert and keeping cool under pressure. These are some some of the skills that I pride myself on as a bandleader and they can only come with years of professional New York experience. Contact us for hiring best wedding bands in New York City.